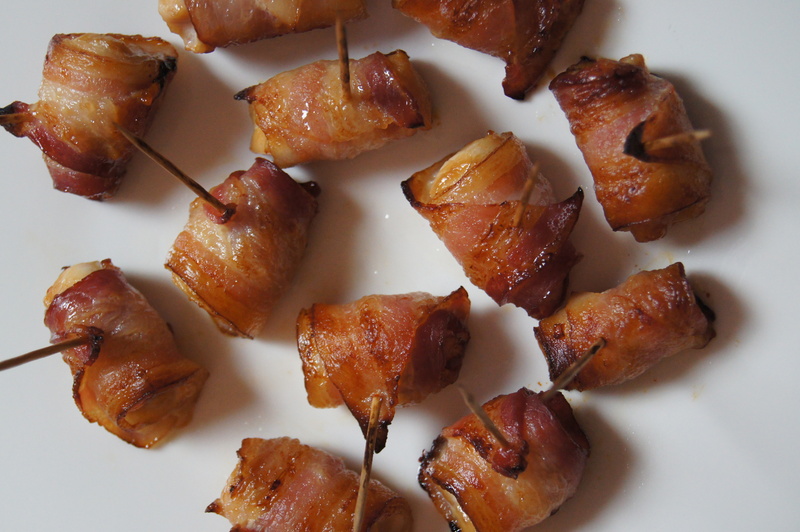 Who doesn’t love scallops wrapped in bacon? I’ll tell you who: people that don’t like scallops. 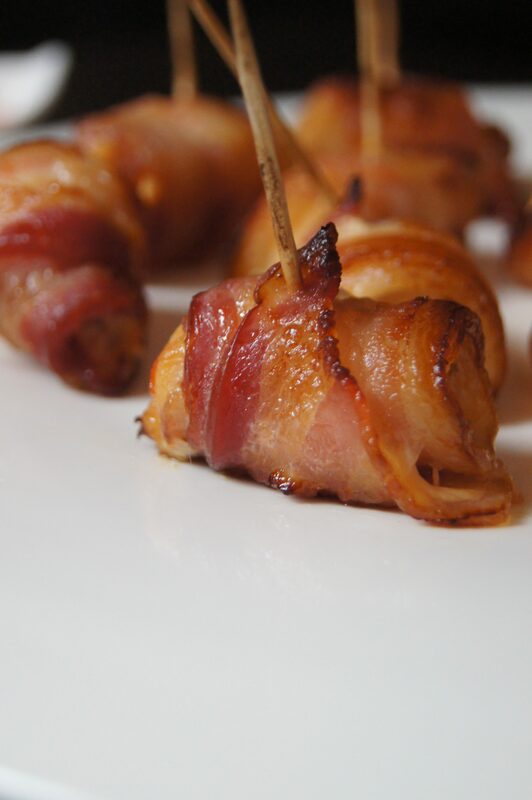 I remember being newly married at Christmas time and my in-laws were serving scallops wrapped in bacon. Everyone was gathered around the platter and enjoying the simple, but luxurious, appetizer. That is everyone except my husband and others in the room that didn’t like seafood. It bummed me out that I was enjoying popping bacon and seafood deliciousness in my mouth and they were having cheese and crackers. But I totally get it. Seafood is definitely an acquired taste and the texture of scallops isn’t for everyone. Later, after I recovered from my scallops wrapped in bacon food coma, I was thinking that there had to be an alternative to this awesome appetizer. And there is: chicken wrapped in bacon! I was flipping through a magazine and saw a recipe for chicken wrapped in bacon and I decided to give it a try. It was OK, but needed a little more flavor and “wow” to it. Since that time, 22 years ago, I’ve taken that same concept and played around with it and came up with these delicious nuggets of awesomeness. I love that they’re pretty quick and easy to make. And you can also have them prepped a few hours ahead of time on your baking sheet. You just pop them in the oven when you’re ready to serve them and your home will be filled with an amazing bacon and chicken aroma – and very happy people. I’ve discovered in making these over the years that you might have some extra strips of bacon that you don’t end up using. If you’re a bacon lover like me, this is a cause for celebration. You can roast the extra slices and have them on their own, or make them part of a fantastic breakfast sandwich the next morning. Or now. I usually make them around the holidays. My oldest son, Jack, who didn’t know I was making them the other day asked, “Why does it smell like Christmas?” He was right! 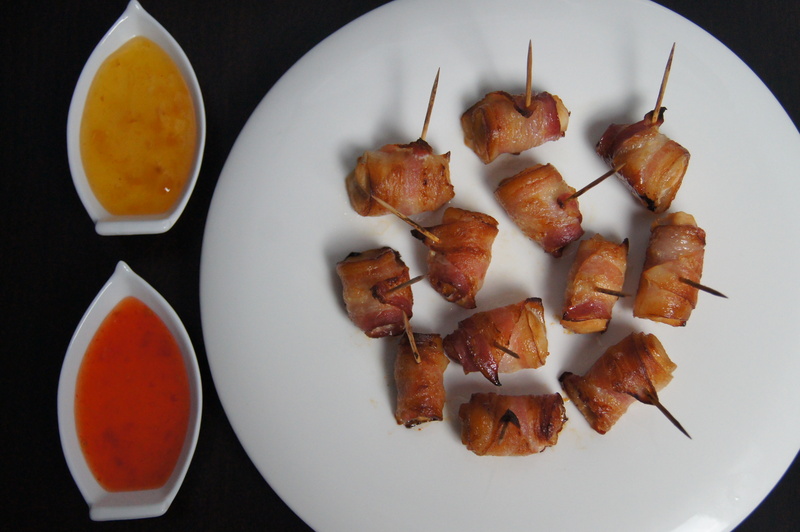 Pine and Ginger Chicken Wrapped in Bacon do go hand-in-hand. With the start of football season, it is kind of like a holiday and these are great for game day or any other special occasion. They’re also great for when you come home from a restaurant, regretting that you didn’t order a second appetizer of scallops wrapped in bacon. These are way better anyway. Maybe I’m a little biased. 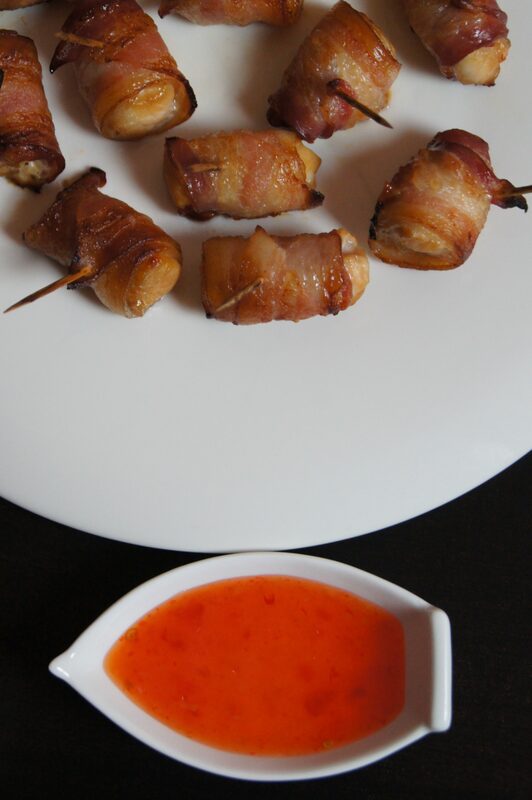 No matter what time of year, or occasion, it always feels like Christmas when you have Ginger Chicken Wrapped in Bacon. 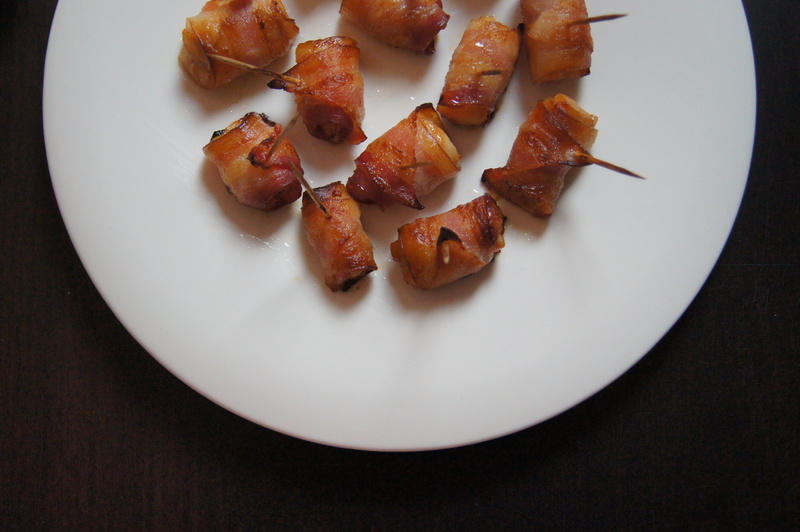 It’s like a nice gift – wrapped in bacon. And really, shouldn’t every gift be wrapped in bacon? This recipe can be easily doubled. I highly recommend that you do double it. Preheat oven to 375° F. Line a sheet pan with parchment paper or non-stick aluminum foil. In a medium bowl combine orange marmalade, soy sauce, ground ginger, and garlic powder. Mix well and add chicken. Let marinate for 30 minutes to 1 hour. Halve each piece of bacon crosswise. Place one piece of chicken on the flat end and wrap. Secure with a wooden toothpick. Bake for 15 minutes. Then broil on high for 1 to 2 minutes. Dip in Thai sweet chili sauce and/or duck sauce and enjoy!